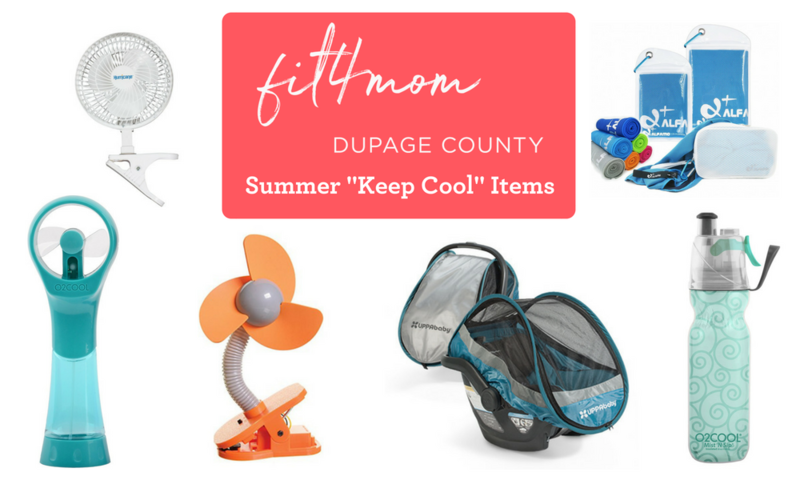 And stay tuned for our blog post next week… 2018 Summer FIT4MOM DuPage County Bucket List. We’ve got lots of fun ideas for you and the kiddos to do - both at home and local spots to hit up! O2COOL Insulated Water Bottle, Mist ’N Sip - Stay cool on the outside with a mist sprayer while you also stay hydrated! Find it on Amazon. Good old-fashioned spray bottle / Mini Squirt Guns - Have fun and stay cool at the same time! Evaporating Sweat Towels - Get them wet and they get cool! Find them at Target or Amazon. Teething Rings - Be sure to get the ones you can freeze. Hats - Look for ones with a strap so the little ones don’t just pull them off right away! Frozen Baby Wipes - Toss them in the freezer and pull them out before class. Then put them in your stroller and keep cool all through class. PackIt Freezable Lunch Bag - keep yours (and your little) snacks cool at class with this freezable lunch bag. Target or Amazon. UPPAbaby Cabana Infant Car Seat Shield - This shields the sun off your baby with a reflective cover but also allows air flow! In addition to these awesome items please make sure you are always wearing a hat yourself mamas, using sunscreen and drinking TONS of water outdoors this summer. Throw an extra bottle in your car for your way home from class or activity.